A participatory art collective that makes ‘tools for the world to take over itself’. In 2006, Mikey Weinkove and I set out to bring spontaneous public conversation to street corners, festivals, nightclubs, and schools. We turned Mikey’s Talkaoke project into a successful small business, providing a mobile chat-show as a public service. That was the first of our artworks for which we developed sustainable economic models. 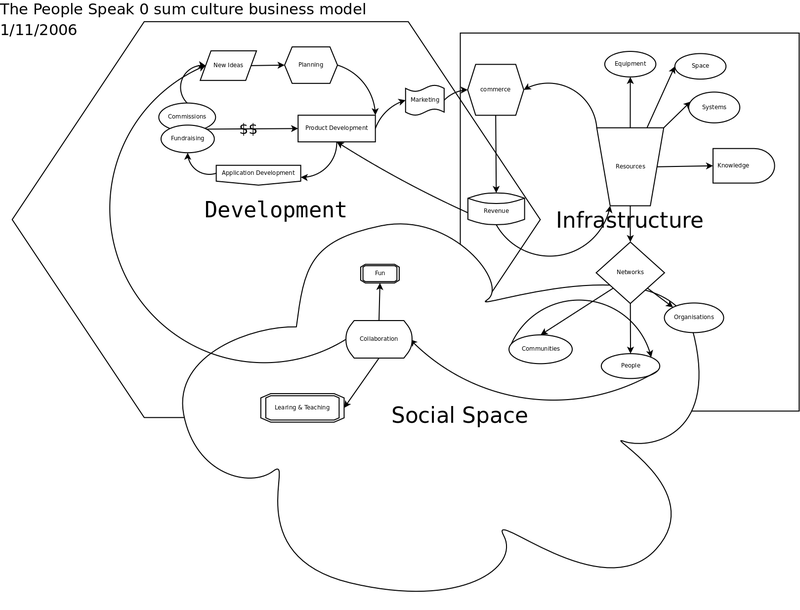 Our ‘Zero Sum Culture Business Model’ aimed to build our existing social and professional networks into an infrastructure for innovating, shaping and deploying new techniques and technologies for conversation, and then turning these into viable products for ongoing micro-social enterprises. After leaving the collective in 2010, I wrote about some of these ideas in Geoff Cox and Tatiana Bazichelli‘s new book on Disrupting Business. Now run by Mikey and Rick Sleiman, the collective continues to do amazing work developing participatory models for art, culture, technology and conversation. The People Speak Team: Mikey Weinkove, Rick Sleiman, Asia Bas, Wojciech Kosma, Zoba Ezeh, Zsolti Balogh, Clare Maloney, Mohammed Jaffar Ali, Jesse Darling, Hektor Kowalski, Pernille Kølbaek, Kate Fenhalls, Olivia Errey, David Weinkove, Rowan October and the many others who contributed to the projects we worked on together. Crucial advisers, supporters, heroes and friends who helped and believed in us early on included Dan Firth, Bob Watson, Emily Druiff, Jörg Baach, Frankie Pagnacco, Nikki Adamson, Ed Gillespie, Tim Aldcroft, Fiona Fieber, Kat Nilsson, and Rhidian Davis.